A lifetime of Bolognese | Izzy have you eaten? From the time you girls could eat solid food bolognese was a favourite. The first time I ever had the sauce cooked at home was in Lahore, Pakistan. Dad and I were newly married, and there we were in a new country, sharing a house with a quirky English guy who was working on a project to preserve the old city. John did not do anything domestic at all. He worked, and came home to meals, and then spent the rest of his time working more in his room. But when he heard we were returning to Australia, John did a surprising thing: he cooked us a farewell meal. From the American commissary where we were able to shop for ‘western’ provisions, he bought his ingredients of tomato paste, a package of parmesan cheese and a large can of tomatoes. He coerced Parvez the driver into taking him to the market, and found his other fresh ingredients. I remember the excitement in the house: he seemed to be cooking all day. The smells that wafted from the kitchen were so tantalizing. After six months of eating mainly dhal and chapatis, the meal was delicious and memorable. Our family recipe is the sum of many friends’ versions. When Graeme and the family came to stay in Richmond, I found he was liberal with the balsamic vinegar. In Los Angeles, Jon cooked his amazing version for our two families one night, and it had small chunks of steak in it with the ground beef. Our friend Madge mentions milk as an ingredient. I love that our family’s ultimate go-to comfort food meal has been shared at our table where ever we’ve lived with just about all our friends. Enjoy it at your table, with your friends! Oh, and be sure to make it your own along the way. When the onion mixture is beginning to melt, add the meat and stir until evenly browned. 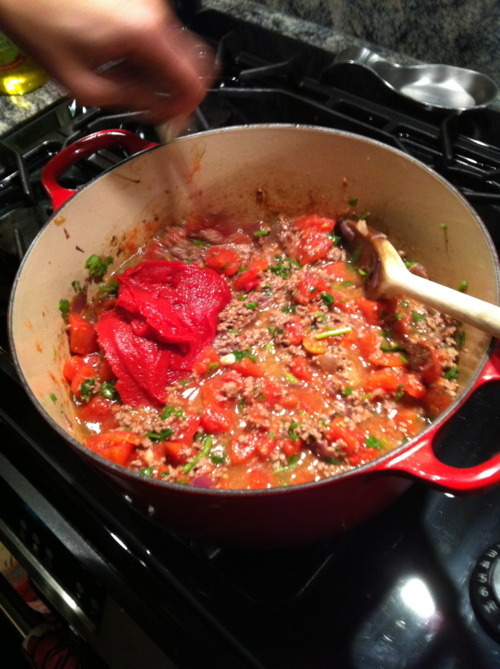 This entry was posted in GROUP C, Uncategorized and tagged Bolognese, Mince, Pasta, Tomato Paste by tgb9593. Bookmark the permalink. cooking this right now! added some carrots to make it our own. it’s such a lovely homely meal – and it reminds us of our mothers!